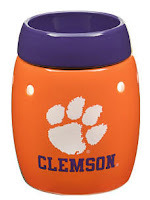 Clemson Girl: A Scentsy giveaway that smells so good! 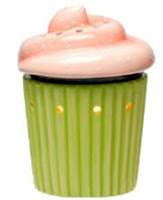 A Scentsy giveaway that smells so good! Have you heard of Scentsy? If you love filling your home with different aromas from candles, then you’re going to love today’s post. Scentsy sells safe, wickless alternative to scented candles -- decorative warmers designed to melt scented wax with the heat of a low wattage light bulb instead of a traditional wick and flame. That's right, flameless! Scentsy warmers are safe to use around kids and pets. No more second thoughts trying to remember if you blew out the candle. Scentsy uses a food-grade wax and only adds the finest scented oils. The exclusive Scentsy wax also has a melting point of just above normal body temperature so the melted wax will not burn. No Flame. No Wick. No Soot. No Lead. We were introduced to Scentsy by Clemson fan Ashley Miles who is a Scentsy Independent Director living in Upstate SC. She joined as a consultant in January 2010 after having been a Scentsy customer for over a year. She loved the products so much that she knew it was something she wanted to share with her family & friends. What started out as a hobby has turned into a fun part-time job for her. Scentsy has 80 wonderful fragrances and over 100 different warmers to choose from, there truly is something for everyone! These holiday warmers and scents are on my wish list – who doesn’t love the smells of Thanksgiving and Christmas? Love these! Scentsy also offers adorable Scentsy Buddies for the kids (or the kid in you). Looking for scents on the go? Check out the Room Sprays, Scent Circles, Travel Tins, Fragrance Foam (hand sanitizer), and the NEW Scentsy Solid Perfume. 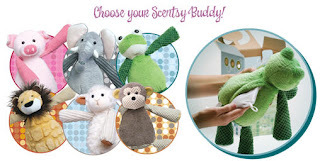 Do you think your friends and family would like Scentsy? If so, then a Scentsy party would be a great option for you. 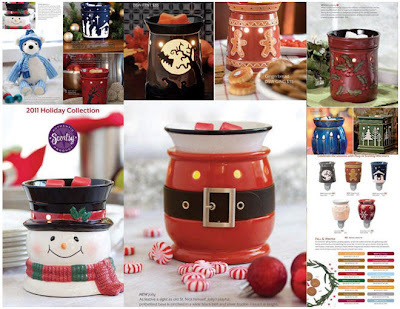 You can earn free Scentsy products by holding a catalog/online party, a basket party, or a home party! Hosts also get an additional gift from Ashley in addition to the wonderful host rewards from Scentsy. Check your calendar and contact Ashley to schedule a Scentsy party. Are you looking for a fun, rewarding job? Then you may want to consider becoming a Scentsy Independent Consultant. You’ll have the flexibility to set your own hours, earn commission, and earn fabulous rewards (Ashley has earned a trip to Disney World!). Want more info on this great opportunity? Call Ashley at 864-617-0766 or visit Ashley’s website for more info. You can purchase any of the Scentsy products online, by phone (864-617-0766) or by emailing Ashley. Ashley would generously like to giveaway a Scentsy prize pack to a lucky Clemson Girl reader so you can experience how great the products are for yourself. 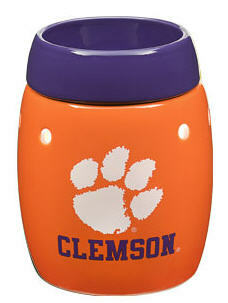 One lucky winner will receive a Clemson Scentsy warmer along with an Autumn Sunset fragrance bar. And she’s also throwing in Scentsy Skinny Dippin Fragrance Foam hand sanitizer. Post a comment on this blog post with your first name, last initial, and where you are from (1 entry). Browse the Scentsy products on Ashley's site and post another comment telling us what your favorite warmer in the catalogue is (1 entry). Tweet about this giveaway on Twitter, include a link to the post and copy @clemsongirl (1 entry). Deadline for all entries will be tonight at 7 PM EST. We will randomly draw a winner and post the winner’s name to the blog around 8 PM EST. The winner will have until Monday at NOON EST to claim their prize or we will draw a new winner. We love giveaways! Good luck! Ooooo I would love one of these, just adopted two new kitties. I love the campus ones or the game day! I shared this on my fb! These would definitely make nice gifts. The Clemson warmer with the purple dish is of course my favorite! I love the Clemson warmer!!! Go Tigers!!! Love the Clemson University Warmer!! I love the Clemson & the Boho Chic warmers! The Clemson warmer is my absolute favorite! I can't even PICK another one, I love this one so much!! I love the Clemson warmer the best!! I also like the Silvervine warmer too. I love the Heavenly warmer and The one about New Mexico it's new too! K Ash Anderson,S.C. I also like the Angora warmer. Autumn Sunset smells like an AWESOME scent! I haven't tried your product, but would love to soon. Sharon W.
Love all the warmers! I have three on in my house right now, but definitely need the Clemson warmer for my Clemson room! Go Tigers! Shared on facebook for all my Clemson friends! Id love to get the Firefighter warmer for my Hubby!